Vidya Mani Mamallan – Electronic Payment And Services Pvt. 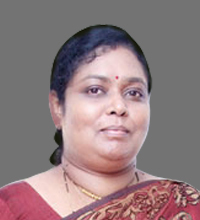 Ltd.
Vidya Mani Mamallan is the President of Human Resources and Administration of Electronic Payment and Services (P) Ltd. and holds a post-graduation degree in Economics from Mumbai University. Fortified with over 14 years of experience in the retail business domain of Bharat Petroleum, she has developed a strong business acumen for finance, accounting and compliance in the corporate sector. Vidya is actively involved in developing organizational strategies in the HR department, by identifying researching human resources issues and is responsible for planning, directing and implementing various programs and processes i.e. employee performance management, recruitment, employee development & retention, resource management, training and education etc.